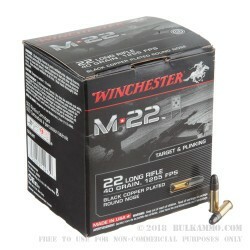 Highly reliable .22LR ammo with some additional perks for shooter who can appreciate the ability for a quality .22LR to be a game changer for semi-autos. 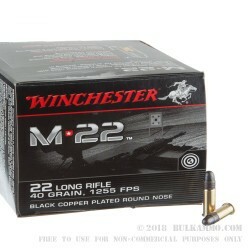 This is among the most reliable .22LR rounds on the market. The black copper plating offers a traditional look, without the direct lead contact. Moderately high velocity offers exceptional cycling and reliability in most firearms. Of particular value to small handguns chambered in .22LR, this is a hot enough round to give good cycling, offers great feeding reliability and has a great reputation for ignition. 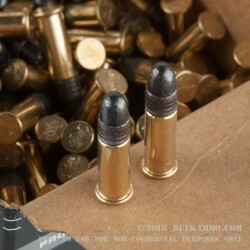 These are more than most .22LR bargain rounds can attest to. This cartridges price point is slightly more than some other .22’s but the benefits of this load outweigh the minor price hike. 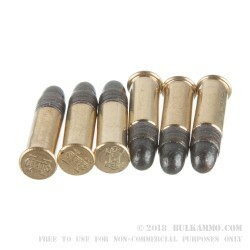 A 40 grain projectile and a very straightforward powder charge that offers a clean experience compared to most value priced loads, this is an ideal round for small pistols, due to the cleanliness and potency, allowing good feeding and functionality in firearms that historically are too tight or heavily sprung to function with lesser rounds. Suitable for use in any .22LR, this is a great bridge between ultra-premium match ammunition and bargain basement plinking rounds. Winchester has produced a fine specimen here.